Background: Androgenetic alopecia (AGA) involves androgen-dependent hair loss and finasteride is an established treatment for the disease. However, reports of the influence of finasteride on hair growth in other areas of the body are lacking. Aims: To investigate the effects of finasteride on hair, including the head and other areas of the body. Materials and Methods: Based on whether AGA patients felt they were pileous in areas other than the head, they were divided into Group A (pileous) or Group B (not pileous). Finasteride (1 mg/day) was prescribed for both groups for at least 6 months, after which patients were asked to estimate the medicine's effects and any changes of their hair growth. Results and Conclusions: A total of 18 out of 37 patients were placed in Group A and 19 of them were in Group B, suggesting that about half of AGA patients in Japan are pileous in other parts of the body. 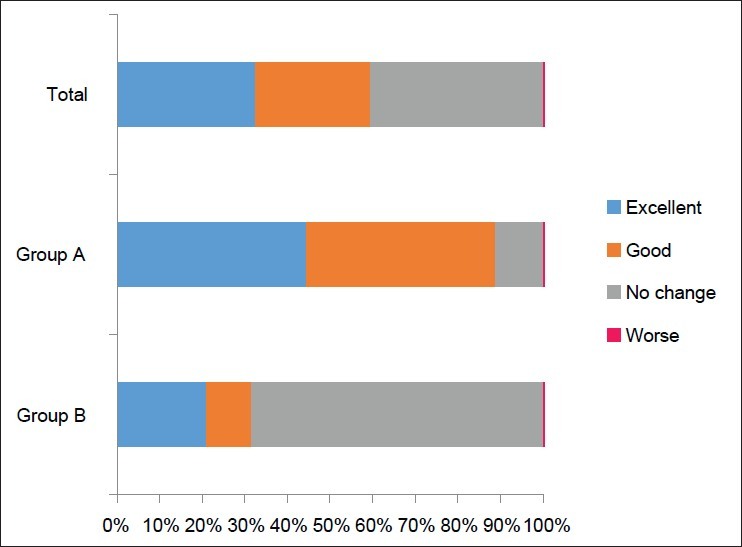 Oral finasteride was effective (excellent or good) in 22 out of 37 (59.5%) patients overall, in 16 out of 18 (88.9%) patients in Group A, and in 6 out of 19 (31.6%) patients in Group B. None of the patients reported that oral finasteride had any effect on their hair growth other than on their head. Finasteride is more effective for treating AGA patients who are pileous in other areas of the body. Finasteride is an established treatment for the androgenetic alopecia, but its effects on body hair in other locations remain unclear. Since the sensitivity of hair papillae to the male hormone differs, the sensitivity to finasteride is expected to differ as well, depending on its location in the body. However, the effects of finasteride on body hair in other locations remain unclear. We now report the influence of finasteride on body hair as well as scalp hair in Japanese AGA patients, to compare its effects on hair growth on the head and on other areas of the body. The objective of this study was to investigate the effects of finasteride on hair growth, including the head and other areas of the body. All 45 male patients, who visited our clinic complaining of AGA between January 2005 and August 2012 and met a clinical definition,  were asked to participate in this study, with an informed consent after explaining the objective of this study. Based on whether the patient felt himself as pileous on areas other than the head, he was placed in Group A (Yes, I am pileous besides head) or Group B (No, I am not pileous). To patients belonging to Group A, an additional question was asked to reveal what part(s) of the body was pileous. Finasteride (1 mg per day) was prescribed for both groups and if no adverse events occurred, the treatment was continued for at least 6 months. The effect of therapy was estimated based on each patient's self-assessment at the end of the observation period in four grades: Excellent, good, no change, or worse. Among the 45 AGA patients, three refused to join the study and five did not continue the therapy so that 37 patients completed the trial. Group A and Group B included 18 and 19 patients, respectively. 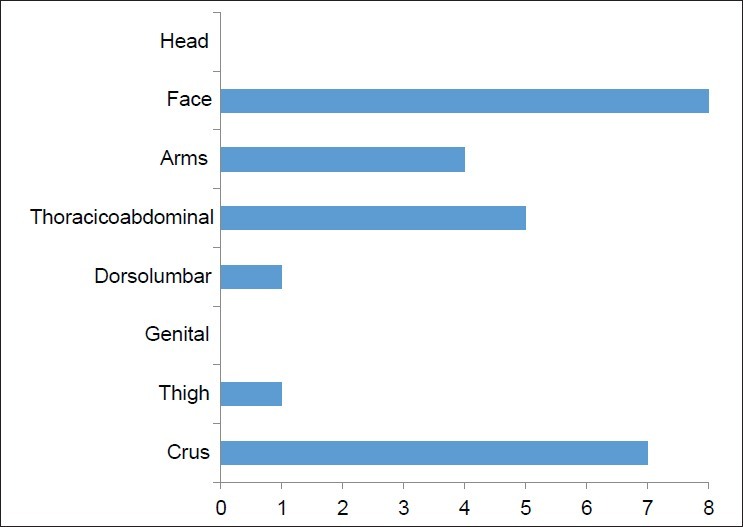 Body parts that they felt pileous are shown in [Figure 1]. The average observation period was 18.2 ± 14.5 months. The average ages of overall, Group A and Group B were 43.7 ± 12.7, 41.0 ± 15.1, and 46.2 ± 10.0 years old, respectively. The average onset ages of overall, Group A and Group B were 31.5 ± 8.8, 30.1 ± 7.8, and 32.9 ± 9.9 years old, respectively. The durations of taking finasteride of overall, Group A and Group B were 18.2 ± 14.5, 15.3 ± 9.4, and 20.9 ± 18.2 months, respectively. Oral finasteride was effective (excellent or good) in 22 out of 37 (59.5%) patients overall, in 16 out of 18 (88.9%) patients in Group A, and in 6 out of 19 (31.6%) patients in Group B [Figure 2]. The patients in Group A reported significantly more effects than the patients in Group B, according to the Chi-square test (P < 0.01). None of them reported that oral finasteride had any effect on their hair growth, other than on their head. No serious adverse events were observed in either group. In human skin, 5R1 is distributed in nongenital skin while 5R2 is in genital skin. Hence, the dominant form of the enzyme in human scalp is 5R1. However, Bayne et al.,  observed 5R2 in the inner layer of the outer root sheath and the infundibular regions of the hair follicle in a specimen obtained from the lesional skin of an AGA patient. Furthermore, only 5R1 was observed in an occipital lesion, where AGA does not develop. According to Kaufman et al.,  oral treatment with finasteride for 1 year improved 65% of AGA patients, judged by investigators. At the same time, finasteride is thought to have lesser effects on other areas of the body, in which 5R1 is dominant. In clinical trials, the rate of "body hair growth changed" by finasteride is very small: "Increase" occurred in only seven out of 779 subjects,  while "decrease" occurred in only one out of 374 subjects. These reports and our results suggest that oral administration of finasteride has only a minimum effect on body hair growth. It seems that about half of AGA patients are pileous in other parts of the body, although it completely depends on subjective findings. According to our results, finasteride seems to be more effective in patients who feel that they are pileous (Group A). One possible explanation would be that finasteride is more effective for patients who are under a stronger influence of androgen. In those patients, higher levels of androgen would exist in hair follicles, resulting in hair loss on their head but they remain pileous in other parts of their body. Finasteride is thought to have better effects in these "androgen-rich" AGA patients. Although we have not evaluated the hormonal differences between Group A and B, Camacho et al.,  reported that patients with higher plasma levels of DHT tend to get better clinical effects by finasteride. In Japan, there is a report in which AGA patients have a pileous tendency on their faces (beard) or thighs  and our results are in agreement with that. This paradox can be explained by differences of sensitivity in androgen receptors in different body areas. If that theory is correct, oral finasteride should have improved hair loss in pileous areas other than the head. However, in most cases, the AGA patients did not notice such changes in these areas. The limits of this pilot study are its small size and that the results are fully dependent on subjective observations. Larger and more objective studies will be required to validate the conclusions. 1. Blume-Peytavi U, Blumeyer A, Tosti A, Finner A, Marmol V, Trakatelli M, et al. European Consensus Group. S1 guideline for diagnostic evaluation in androgenetic alopecia in men, women and adolescents. Br J Dermatol 2011;164:5-15. 2. Mumcuoglu C, Ekmekci TR, Ucak S. The investigation of insulin resistance and metabolic syndrome in male patients with early-onset androgenetic alopecia. Eur J Dermatol 2011;21:79-82. 3. Yi, SM, Son SW, Lee KG, Kim SH, Lee SK, Cho ER, et al. Gender-specific association of androgenetic alopecia with metabolic syndrome in a middle-aged Korean population. Br J Dermatol 2012;167:306-13. 4. Hajheydari Z, Akbari J, Saeedi M, Shokoohi L. Comparing the therapeutic effects of finasteride gel and tablet in treatment of the androgenetic alopecia. Indian J Dermatol Venereol Leprol 2009;75:47-51. 5. Gassmueller J, Hoffmann R, Webster A. Topical fulvestrant solution has no effect on male and postmenopausal female androgenetic alopecia: Results from two randomized, proof-of-concept studies. Br J Dermatol 2008;158:109-15. 6. Rossi A, Mari E, Scarno M, Garelli V, Maxia C, Scali E, et al. Comparative effectiveness of finasteride vs Serenoa repens in male androgenetic alopecia: A two-year study. Int J Immunopathol Pharmacol 2012;25:1167-73. 7. Rathnayake D, Sinclair R. Male androgenetic alopecia. Expert Opin Pharmacother 2010;11:1295-304. 8. Goodarzi HR, Abbasi A, Saffari M, Haghighi MF, Tabei MB, Noori Daloii MR. Differential expression analysis of balding and nonbalding dermal papilla microRNAs in male pattern baldness with a microRNA amplification profiling method. Br J Dermatol 2012;166:1010-6. 9. Kaufman KD, Olsen EA, Whiting D, Savin R, De Villez R, Bergfeld W, et al. Finasteride in the treatment of men with androgenetic alopecia. Finasteride Male Pattern Hair Loss Study Group. J Am Acad Dermatol 1998;39:578-89. 10. Russell DW, Wilson JD. Steroid 5α-reductase: Two genes/two enzymes. Annu Rev Biochem 1994;63:25-61. 11. Eun HC, Kwon OS, Yeon JH, Shin HS, Kim BY, Ro BI, et al. Efficacy, safety and tolerability of dutasteride 0.5mg once daily in male patients with male pattern hair loss: A randomized, double-blind, placebo-controlled phase III study. J Am Acad Dermatol 2010;63:252-8. 12. Bayne EK, Flanagan J, Einstein M, Ayala J, Chang B, Azzolina B, et al. Immunohistochemical localization of types 1 and 2 5 α-reductase in human scalp. Br J Dermatol 1999;141:481-91. 13. Nakanishi S. Expression of androgen receptor, type I and type II 5α-reductase in human dermal papilla cells. In: Van Neste D, Randall VA, editors. Hair Research for the Next Millennium. Amsterdam: Elsevier; 1996. p. 333-7. 14. Kawashima M, Mizoguchi M, Igarashi A, Toda J, Kitahara H, Murata K, et al. Long term (3 years) efficacy and safety profiles of finasteride in Japanese men with AGA. Jpn J Clin Dermatol 2006;60:521-30. 15. Camacho FM, Garcia-Hernandez MJ, Fernandez-Crehuet JL. Value of hormonal levels in patients with male androgenetic alopecia treatew with finasteride: Better response in patients under 26 years old. Br J Dermatol 2008;158:1121-4. 16. Miyakura T, Okoshi K, Mizukami J, Muro M, Yamamoto M, Arai K, et al. An analysis of the classification and background of AGA patients treated with finasteride and remarks on the efficacy of this drug based on patient feedback. Jpn J Dermatol 2008;118:213-9. Finasteride is more effective for treating AGA patients who are pileous in other areas of the body.